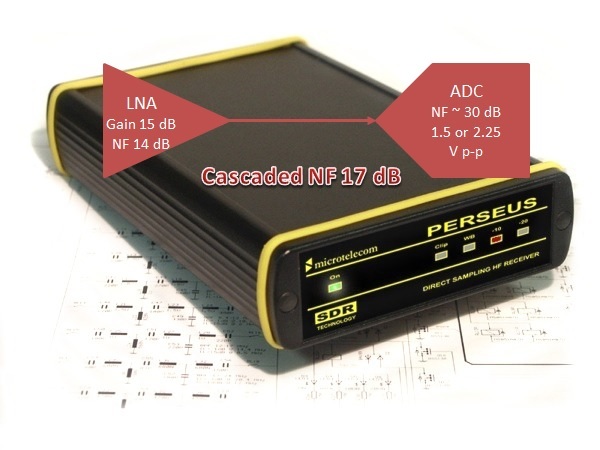 Many listeners have wondered about the mysterious Perseus SDR Preamp that seems to do nothing much. Mystery solved. Here’s how. Over the past ten years, various writers and groups have discussed the mystery about what the Perseus SDR Preamp actually does. The mystery is that switching the preamp on and off does not seem to have any real effect on performance. So, I started digging around. I found the Perseus front end is comprised of a Texas Instruments THS4509 Low Noise Amplifier followed by the Analog Devices LTC2206-14 bit ADC. Most people assume that when you select the Perseus SDR preamp, you are actually turning the Preamp on and off. But this is not the case! The LNA is always on! Otherwise, the Perseus could not achieve its 17 dB noise figure. If you study the ADC data sheet, you will find that it has two modes: PGA=0 and PGA=1. The PGA is a programmable gain amplifier that sets the ADC reference voltage to either 2.25 or 1.5 V peak-to-peak. At the higher reference voltage, this analog-to-digital converter has slightly better SNR – about 2-3 dB. At the lower reference voltage, you experience slightly better dynamic range. The Perseus SDR Preamp control simply switches reference voltage in the ADC. The actual preamp, or LNA, stays on all the time. I started by estimating the actual ADC Noise Figure using the method described by Texas Instruments. The NF for the LTC2206-14 is approximately 30 dB at either full-scale voltage. Full-scale input signal for the Perseus is around -6 dBm. Since the full-scale signal at the ADC is around 9 to11 dBm, this tells me that the LNA is adding at least 15 dB of gain. Reading the THS4509 data sheet told me that its NF was around 14 dB at the 15 dB gain level. This device can provide 6-20 dB of gain with NF decreasing at higher gain. Finally, doing the cascaded noise figure calculation of the LNA (gain=15, NF=14) with the ADC (gain=0, NF=30) provides a final system noise figure of 17 dB. This is what the Perseus specification read. Mystery solved. The Perseus SDR Preamp is always on and used to create the lower radio noise figure. The “Preamp” switch just raises and lowers the ADC reference voltage to optimize the receiver for either SNR or dynamic range.